I find this more and more helpful in the repertoire as so many children – small children at any rate – seem to be kept on strict wheat-free diets by their parents these days. This is why I’ve given the option of replacing the breadcrumbs with porridge oats, and very well it works, too. All in all, it is just about the perfect children’s tea. In a large bowl, using your hands, combine the mince, parmesan, breadcrumbs or oats, parsley, eggs, garlic, and add some salt and pepper. Do not overwork it, just lightly mix together or the meat will become compacted and dense. Butter a round baking tin of about 28cm/11in diameter and turn the meat into it, pressing the mixture lightly with your fingers to cover the bottom as if the seasoned minced meat were your pizza crust. Make sure you’ve drained as much runny liquid as possible out of your can of chopped tomatoes, then mix the tomato with the garlic oil, oregano and some salt and pepper and spread, using a rubber spatula, lightly on top of the meat base. 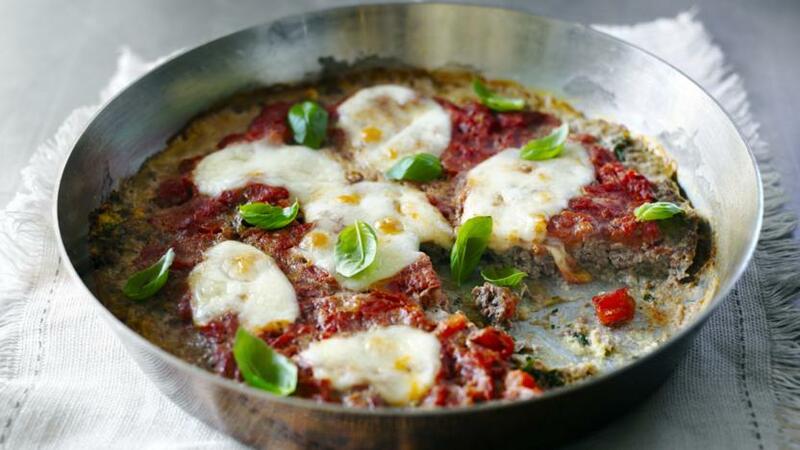 Arrange the mozzarella slices on top, and then put in the oven for 20-25 minutes, by which time the meat should be cooked through and lightly set and the mozzarella melted. Remove from the oven and let it sit for five minutes, then adorn with some basil leaves and bring it to the table before cutting into wedges, like a pizza.